NASCAR driver Kyle Busch, who is currently third in the Sprint Cup standings, was charged with reckless driving this afternoon for driving 128 mph in a 45 mph zone in what's being described as a "yellow Lexus sports car." Ahem, Lexus LFA. Update!. It all happened Tuesday afternoon near Troutman, North Carolina. 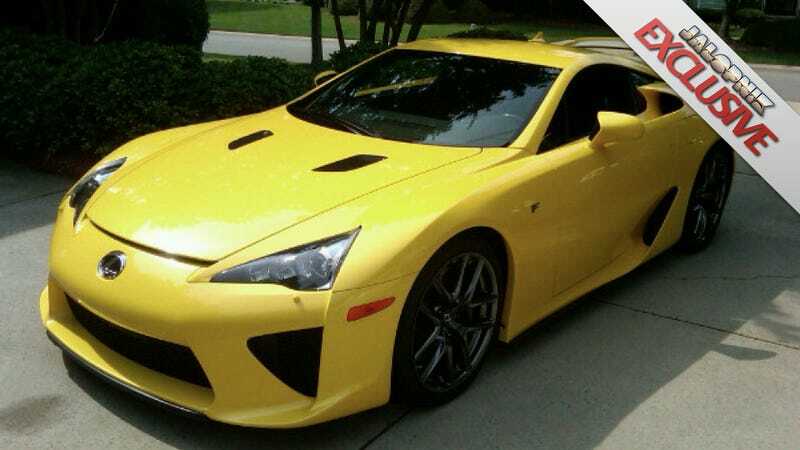 A Sheriff's deputy who is a member of the "Aggressive Criminal Enforcement (ACE) Team" clocked Busch in what we assume is an LFA along Perth Road. Busch was cited for careless and reckless driving as well as speeding. Busch drives the Interstate Toyota Camry, which might explain how he got hooked up with the fast ride, which the one teammate Denny Hamlin bragged about driving just yesterday. We've got a picture of the offender above. Maybe he was just celebrating his big truck win? The Lexus LFA is a unique sportscar with tremendous capabilities. Lexus gave Kyle Busch the opportunity for a demonstration drive and he obviously chose to test those capabilities. He is scheduled to return the LFA tomorrow and we're confident he'll do so in a responsible manner. Looks like Lexus is getting their car back and they're not worried about him blasting above 120 mph to do it.